There’s a refreshing clarity and directness—call it a guiding practicality—in the whole presentation. Check out the rear-panel connections: exactly one set of A inputs and one stereo pair of audio outputs, plus a single antenna connector. Apparently Philips’ marketing gang couldn’t resist adding just one little bell (or is it a whistle? ): an S-video input. It’s there if you want to use it, but don’t feel compelled. But don’t under rate this television. That would not be, uh, very smart. I’ll get to its generous list of useful niceties in a moment. First, however, the matter that really counts: the picture. It’s very good. For the price, it’s downright remarkable. Indeed, the picture quality on this Magnavox-brand television brings to mind the whole business of brand cachet. I won’t say the TP3272C is simply the best Philips-brand television with a Magnavox logo slapped on the front. However, I am quite familiar with the recent evolution of Philips’ primary line of televisions, and this one bears a clear family resemblance. To be more precise, the image was even but subdued. In the end, reining in the red required a reduction in the overall color level. Purging the reddish oversaturation to the point where textures were clarified meant losing some of the overall color. But this procedure was not as drastic as it may sound. Although the adjusted hues were not brilliant, they were consistently warm, with variable skin tones in the natural way that skin tones are. Picture illumination was ample and constant from center to corners. And while Philips makes a legitimate point of its Black Stretch circuitry, which is intended to render darks very dark, I was never conscious of excessively high contrast nor the loss of shadow detail that invariably goes with it. In a Fried Green Tomatoes fight with the Mitsubishi CS-40805 (also re viewed in this issue), after Gannon had corrected both pictures, the Magnavox came out a distant second, lacking (ironically, as it turned out) the Mitsubishi’s gorgeous reds and its rich palette of greens and browns. But for a fraction of the Mitsubishi’s price, the properly tweaked Magnavox offered what Gannon rightly characterized as “a lot of television.” And to be completely fair, the inexpensive Magnavox, having gotten the ISF treatment, was just as easy on the eyes as the Mitsubishi. It is no academic point to under score the attractiveness of the Magnavox after Cannon’s corrections—which, by the way, were not all that extensive. Given the fierce competition on the showroom floor, it’s very clear that virtually all television pictures are skewed for some effect or other and that any body would be well advised to have a new set checked out by an ISF-trained technician. Viewed apart, the Magnavox took on a very satisfying look. We’re certainly not talking about a sepia aspect here. Still, comparison with the Mitsubishi is probably too great a stretch. The CS-40805 (post-Cannon) ranks among best televisions I’ve seen. While it costs four times as much as the Magnavox, well, such is the difference between good value and a grand image with great character. Nevertheless, the Magnavox is a surprisingly good television for a price that’s completely out of sync with the models reviewers usually see. Actually, the Magnavox boasts several features usually associated with fancier televisions. It has an Invar shadow mask, which doubtless contributes to the coherence and restfulness of its picture. First-time setup is a breeze, thanks to an on-screen guide and a remote control that’s logically laid out. Speaking of the remote, it’s a universal learning device. More importantly, you can’t lose it. When you want to watch TV, just touch the power button on the set and the remote starts beeping. Magnavox calls this feature the Remote Locator. It’s slick, very slick. 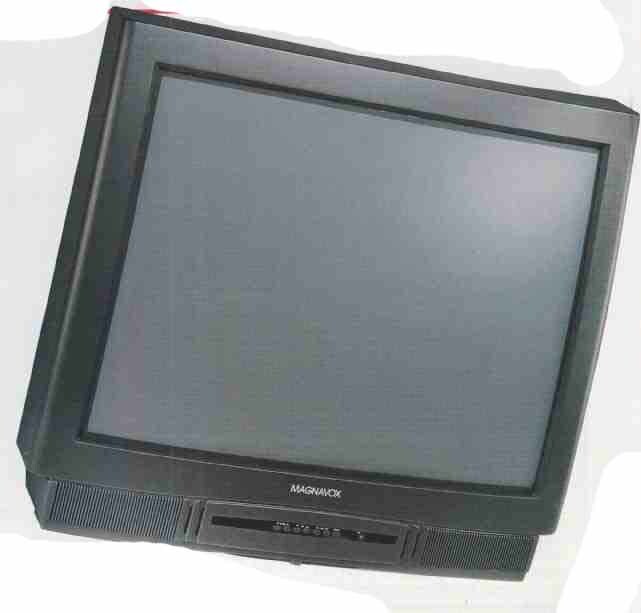 The Magnavox also offers single- tuner picture-in-picture, which means you must connect the TV to a VCR and use its tuner to see one picture inset in another. On the bells-and-whistles side is a feature called Smart Picture, which provides four picture quality presets that skew the image to accord with somebody’s idea of how video games, sports, and movies (plus weak station signals) should look. I must confess I fail to get it. A properly adjusted picture is adjusted for everything. Bah-humbug. Philips claims the built-in sound system incorporates a spatializer that simulates “surround sound” from regular stereo. I can take that on faith. If you insist on using the on-board sound, at least there’s a limiter that prevents commercials from blasting louder than the program. Philips calls this Smart Sound. No argument here. This Magnavox 32-inch television deserves a place near the head of the “Good Value” class. Combining a well-balanced picture with practical design features and a sensibly de signed remote (which is never lost for long) at the gentle price of $900, the TP3272C is an undeniable bargain. 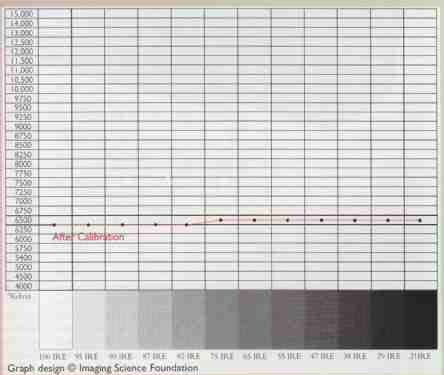 After the initial review period, John Gannon of Detroit-based AudioVideo Insight arrived to calibrate the set and provide a technical evaluation according to the standards and correction methods of the Imaging Science Foundation (ISF). Gannon characterized the uncorrected picture as "a serious reddish blue, with significant oversaturation of red" He noted that the uncorrected gray-scale tracking was "reasonably linear:' although the blue was turned up a bit. The gray scale initially ranged in color temperature from 11,000° Kelvin at the bright extreme to 13,000° Kelvin at the dim end, but it nevertheless appeared closer to the NTSC standard than the Mitsubishi. According to Gannon, the illusion of a very accurate gray scale "might have been attributable to the difference in ambient color and lighting between the two rooms where the televisions were set up." He also noted that "other Philips and Magnavox TVs I've seen have shown very small variance in their gray-scale tracking”. The color decoder-the device that breaks down the composite video signal into red, green and blue-"was definitely pushing red, and the blue was kicked up. The red was probably boosted to compensate for the blue and maintain acceptable flesh tone and wood tones. That's not an uncommon choice for manufacturers of lower priced sets’. The television’s geometry, its ability to produce perfect squares and circles, was “well controlled”.